It's a brave science writer who puts into a single, not over-long book, the entire cosmology of the universe from beginning to end, all the physics required to support it, and some of the history of science of the development of both the physics and cosmology. Luckily, Paul Parsons is a steady and highly experienced hand, who is able to introduce some of the most esoteric aspects of modern science while still leaving the reader feeling that they have a grasp of what's going on. 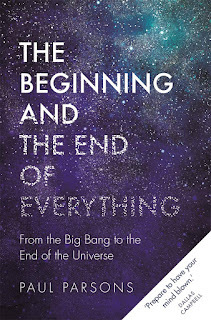 The individual components of the book - the big bang, the formation of stars and galaxies, black holes, dark matter and dark energy, the general theory of relativity and quantum physics, and all the rest - have been well covered in separate books many times, but what Parsons is able to do is to give us the latest information, including material from 2018, and to pull the whole together impressively well. So, for example, along with the more traditional means of exploring the universe through electromagnetic waves, we are able to discover the importance of the discovery of gravitational waves and can see how future gravitational wave observatories will help us to firm up and expand some aspects of cosmology. The two areas there are bits of extra material that older hands might not be so familiar with is the coverage of inflation and the work of Stephen Hawking. Parsons has some personal history from his time at university on the inflation front and is able to give one of the best descriptions I've seen of inflation and some of the variants thereof - the only slight oddity is that this gives us rather more depth on this topic than the rest of the book has. Similarly, Parsons is clearly a huge Hawking fan and gives quite a lot of detail on relevant aspects of his work, even if this does perhaps over-emphasising the significance of Hawking's final paper. If the book has a weakness it's a tendency not to make clear which bits of what we're being told are solidly supported by additional observational data, and which are theories (or even philosophies) for which there is little confirming evidence, or are based on very simplified models of the universe. We're told, for example, 'the anthropic principle falls flat without a level II multiverse to back it up... if there's only one universe, the the fact that we find it to be suited to the emergence of life - especially when physics says this is unlikely - is genuinely baffling.' But (one version of) the anthropic principle exactly reflects this - it's not at all baffling, because we wouldn't be here to observe it were it not the case. And it doesn't matter how unlikely a particular universe is. If there is only one universe, that whichever one it is has to be very unlikely - making it a bit of a 'so what?' point. Apart from a desire for a little more clarity in separation of the inevitable speculation that accompanies cosmology from the science (and a wish that we could have avoided the old chestnut that Giordano Bruno was martyred for his scientific views - he wasn't), this is a wonderful introduction to one of the most exciting and engaging aspects of science. It's doubly impressive that Parsons does so while covering so much, leaving little space to meet the characters involved, which is often used to give more engagement. 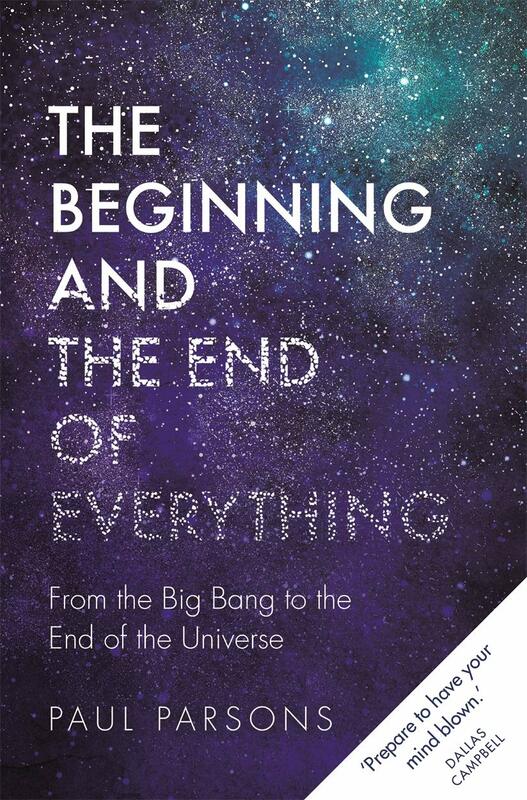 I will be recommending this book to anyone looking for an introduction to cosmology.